Coming off an impressive 2007-2008 campaign that was highlighted by sweeps of the Penn State Multi Meet and the NIFWA Championships, the fencing team played host to the 29th annual Temple Open at McGonigle Hall last weekend. The Open is known for having the largest competitive field in the United States, as this year’s Open consisted of 30 schools, making it one of the largest in history. 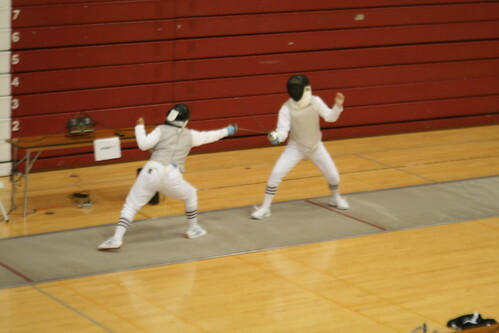 In addition, the Open provides fencers with the opportunity to gain competitive experience. The results were highlighted by junior Kristin Howell winning the epee competition and freshman Kamali Thompson finishing in a tie for third in the sabre. In addition, junior Melissa Parker finished fifth in the foil, sophomore Grace Wu finished fifth in the epee, sophomore Alyssa Lombardi finished sixth and senior Kaitlyn Uckert finished seventh. The fencing team, led by legendary coach Nikki Franke, performed well at the Temple Open, as Kristin Howell won the epee and Kamali Thompson finished in a tie for third in the sabre (TTN File Photo). Meanwhile, sophomore Audrey Barroso and junior Christie Griffith finished in a tie for fifth and eighth, respectively, in the sabre. That first competition, the Penn State Open, helped give the team its own identity. It will be a new squad, as the Owls graduated four seniors last year and are left with three fencers leading things this season. One of them is team captain Uckert, who finished last season 35-11 while qualifying for the NCAA Regionals. As for the five incoming freshmen, Uckert only has two words of advice for them. Perhaps being relaxed helped the Owls prepare for the Temple Open, which, Uckert said, isn’t all that pressure-filled, despite being such a large fencing competition. Another reason for the relaxation may have been that the Owls already finished the Penn State Open, the other large individual tournament, earlier this month. The Owls entered that competition with nine returning letter-winners, most notably, all-Americans Kristin Howell and Melissa Parker. Parker, who became Temple’s first second team all-American since Lisa Honig in 1994, finished last season 28-14, while placing second in the NCAA Regionals. She made the foil finals at the Penn State Open, where she finished sixth. Howell, who became Temple’s first epee all-American, ended last season at 27-10 and finished ninth in the NCAA Championships and second in the U.S. Fencing Junior Olympics. She was ranked No. 8 in the nation and earned the Female Student-Athlete of the Year award. Lombardi’s qualifying for the NCAA Regionals last season has prompted her and all the other fencers to work extra hard. The Owls return to action Dec. 6 in the Vassar College Multi-Meet in Poughkeepsie, N.Y.